Ensuring your data survives a disk problem is a great worry for most people and businesses. RAID is all about making sure you can get to your files when you want to and to protect them when something goes wrong with the disks that store them. Unbelievably some ignore the potential problem and do not perform even the most basic back-ups. Furthermore, some even store everything on a single USB disk never contemplating it is just as likely to fail as the disk in their PC. The author has a friend who lost thousands of photographs for exactly this reason. Only when it was too late did he understand about backing up irreplacable data. A simple question is: "if I lost this, would it hurt?" If the answer is YES then you need to make it NO. It is that easy. A good way of safeguarding data is to use several disks to store it - to always make sure you have the data in more than one place. This might simply be a case of copying one disk to another but a better way is to spread the data across the disks and use some mathematics and electronics to make sure it stays safe. A RAID array will do this and a plus point - it is usually faster than a single disk. RAID comes in several different flavours called "Levels" and each has strengths and weaknesses. There now follows a discussion of the levels you are most likely to encounter and a discussion of the pros and cons of each. The above diagram is called the "CAP Triangle". 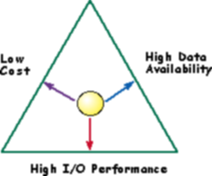 It may be thought of as representing extent of three critical requirements of disk storage: Cost, Availability (how likely your data is to survive a problem) and Performance (how quickly can you Read and Write that data), Every disk storage method can be thought of as occupying a point within this triangle- the closer to an edge, the greater degree of this property it possesses, the further away, a lesser degree. As a rule of thumb, each disk mechanism in a RAID set needs to be of the same capacity and preferrably model. Most RAID controllers will permit some "mix n matching" but the lowest capacity of any single drive will be imposed on all disks in the array. e.g. if a simple RAID5 array is composed of 1x320Gb and 3x500Gb member disks, the whole group will be treated as 4x320Gb disks. Some RAID controllers have a very limited range of disks they will work with due to close-coupling of the low level commands of the disk interface to the firmware of the controller to gain increased performance. In all instances you will need to check that disks and controllers you plan to use are compatible. The most common RAID levels, listed below, approach data redundancy by duplicating physical blocks of disk storage (i.e. at a hardware level on the actual disk plattens) across multiple mechanisms. This is enhanced further by some methods using mathematical tricks to store a fingerprint of the data (parity) on another disk. This can be used to rebuild any missing data in the event of a failure. Each RAID level exhibits its own unique benefits and drawbacks. This overview will attempt to highlight each or help you find the right RAID level for your particular application. Please note that the numbers assigned to each level of RAID do not indicate superiority, they are merely for differentiation. It is also important to remember that most RAID configurations require all member disks to be the same capacity (if not the same make & model). Not a true RAID because it is not fault tolerant. Data Availability is statistically worse than a simple, single disk - Loss of any one disk will destroy the data on the entire array. Should never be used for permanent storage or in mission critical environments because of the high probability of data loss. Unless capacity is key, consider using RAID 10 (to provide data security) which can deliver similar read speeds. High Data Transfer Performance. RAID 0+1 is NOT to be confused with RAID 10. Two sets of striped disks are mirrored and a single drive failure will cause the whole array to become, in essence, a RAID Level 0 array. Requires a minimum of 4 drives to implement. High I/O rates are achieved thanks to multiple stripe segments. Large memory buffers on disks and controllers can make RAID0+1 very fast for both read and write accesses. Expensive due to 100% overhead - Only half the total capacity is available for storage. All drives must move in parallel to give full potential. If the disks or controller cannot provide this function poor sustained I/O performance will result. Limited scalability at high inherent cost. Once defined, a RAID 0+1 array is difficult to expand and must usually be destroyed and rebuilt. Mirroring and Duplexing. RAID level 1, or mirroring, has been used longer than any other form of RAID. Level 1 provides redundancy by writing identical data to each member disk of the array, leaving a "mirrored" copy on each disk, thus a second copy of each data block is available should the first become un-usable. Mirroring remains popular due to its simplicity and high level of data availability. Level 1 operates with two or more disks that may use parallel access when reading to improve I/O performance. Level 1 provides very good basic data reliability and improves performance for read intensive applications but at relatively high cost. For best performance, the controller must be able to perform two concurrent separate reads per mirrored pair or two duplicate writes per mirrored pair. RAID Level 1 requires a minimum of 2 drives to implement. High Reliability combined with High Performance. Not to be confused with RAID 0+1, RAID 10 is implemented as a striped array whose segments are RAID 1 arrays. It has the same fault tolerance as RAID level 1 with the same overhead for fault tolerance as mirroring alone. RAID Level 10 requires a minimum of 4 drives to implement. It is arguably the most common RAID level and provides an excellent trade-off in simplicity of implimentation and speed in use. Excellent solution for sites that would have otherwise gone with RAID 1 but need some additional performance boost. Large memory buffers on disks and controllers can make RAID10 very fast for both read and write accesses. Hamming Code ECC. Each bit of data word is written to a data disk drive. Each data word has a Hamming Code or Error Correction Code (ECC) word recorded on the ECC disks. On Read, the ECC code verifies correct data or corrects single disk errors. Independent Data disks with distributed parity blocks. By distributing parity across some or all of an array's member disks, RAID level 5 reduces (but does not eliminate) the write bottleneck inherent to level 4. As with level 4, the result is asymmetrical performance, with reads substantially outperforming writes. Level 5 is often used with caching to reduce the asymmetry. Each entire data block is written on a data disk; parity for blocks in the same rank is generated on Writes, recorded in a distributed location and checked on Reads. RAID 5 requires a minimum of 3 drives to implement but provides a higher proportion of the array as usable storage over RAID0, RAID1 and their variants. Certain variants (usually non standard and collectively termed RAID 5+) use a second disk for parity thus permitting multiple simultaneous failures. Not really a RAID configuration, it is included here because many RAID controllers can support hard disks just as a simple controller. When working in this mode it is termed "Just A Bunch Of Disks". Clearly, the RAID controller is being under-exploited and offers none of the advantages detailed above except that the all the disks are available for storage. Some controllers also allow the disks to be "Spanned" in JABOD. Subject disks become a single contiguous array, similar in concept to RAID0 except that spanning supports different capacity disks and each disk is filled consecutively. RAID is getting quite old and has always approached the problem of data redundancy by duplicating disk blocks (which is the main reason behind individual member disks being the same capacity). New filesystems and approaches are producing a raft of generally proprietory systems. These are often given RAID-like names to make capital on a familiar phrase and concept. Data Robotics use a system called "Beyond RAID" in their DroBo series of filers. This uses a non-block approach to data security, rather splitting data into variable size files on a proprietory filesystem. This provides excellent redundancy and allows for different size disks to be used without compromising either capacity or redundancy. It also supports two parity disks (see RAID 6). Read and Write times are comparable with RAID 5 but deletes can be very slow, especially on larger files - possibly due to the filer being a Linux based system and so the filesystem likely based on ext3 (ext3 wipes every iNode for a file delete rather than just marking the space as free in the directory - large files have lots of iNodes). New filesystems have RAID-like features built in without the need to apply some other scheme at a hardware level. These are arguably a better path to follow as being either non-proprietory or ubiquitous, there is more chance the disks are transferrable between systems while keeping the data intact. A RAID array is tough and with proper maintenance, will provide the best security for your data, but it is not infallable. Most importantly - it is not a replacement for a proper back-up regimen - even though it might form a crucial part of it. Backing up local disk to a RAID array is excellent practice but the array itself needs to be backed-up also. If you are serious about irreplacable data, you have to accept an unpleasant truth - one day it is going to let you down. WHEN that day comes, you need to have your last chance copy of the data to ensure you can rebuild your working data. Computers can be rebuilt, their Operating Systems can be replaced. Last years accounts, all your live invoices and customer records cannot be. You absolutely must have a secondary copy of all live data and it should not be stored close to the original - if your offices burn down, this second copy is going to be no use if it was kept in the same server room. Be smart, accept this truth and invest in some off-site data storage. At the most basic (as that is what most small businesses can afford) buy some good synchronization software and a large external disk and take it with you when you go home each night. If you never have to use it, be happy!